I thought it worthwhile to somehow piece together the drive train without the main body parts which houses the gearing. To get them in some semblance of order and position, I made a wooden stand to support the various parts as they are to be found. For obvious reasons, some parts are now not indicated and these have been marked with an asterisk. I hope this will be of use. Note: This gearing set up is restricted to Wood / Metal cutting bandsaws with Serial Nos. BK 3605 up to BU 8779 (roughly spanning late 1955 through 1957). Key to Picture. Items marked with asterisk * are not shown / not indicated in the picture. Retaining rings / special arc rings have not been indicated. This knob is termed a clutch and engages the DRIVE PULLEY when pushed in and vice versa. The DRIVE PULLEY which is utilised when the wood cutting speed is required. This is the BEARING NUT which secures the BEARING in the main body*. The drive shaft BEARING which is located on the main body, pulley side. Two SPRING WASHERS within the bearing cavity in the main body. The CLUTCH which is housed within a hub on the DRIVE GEAR. This is a SLEEVE on the drive shaft*. The other drive shaft BEARING which is located in the main body, lower wheel side. BEARING supporting the INTERMEDIATE GEAR and is housed within the cover* which attaches to the gearbox body. The INTERMEDIATE GEAR SHAFT which is driven by the DRIVE GEAR. BEARING supporting the INTERMEDIATE GEAR and is housed within the gearbox body*. 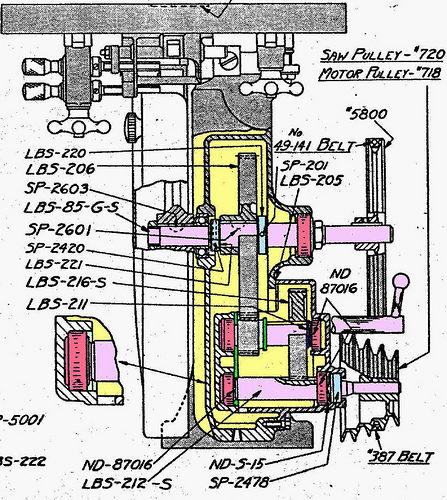 The PULLEY SHAFT which exits the gearbox body through an oil seal*. The BEARING supporting the PULLEY SHAFT which is located in the gearbox body*. 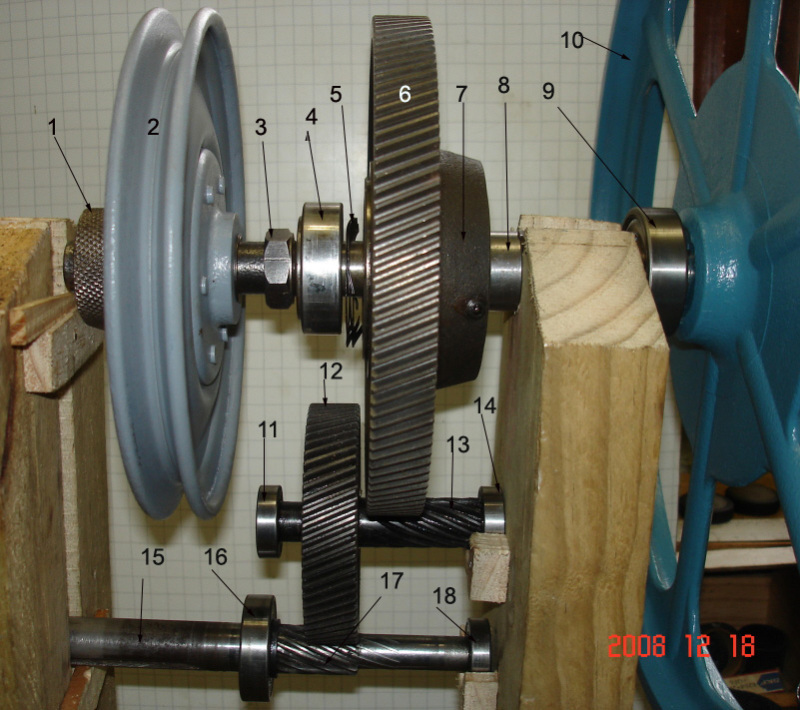 The PULLEY SHAFT DRIVE GEAR which is driven by the INTERMEDIATE GEAR. The BEARING supporting the PULLEY SHAFT and is housed in the gearbox cover*. Additionally, this diagram displays the gearing for some earlier Delta wood/metal bandsaws.